After taking up the reins of his father’s shoemaking business, twenty-something Alex finds himself in Guangdong, South China. The reality of his situation, of running a foreign business using local workers in a country on the cusk of great economic and political change, quickly hits him. As he begins to realise just what his father has had to do in order to maintain the business, and witnesses first-hand the conditions under which their employees work, Alex’s relationship with his father begins to shift. When Alex meets the fascinating Ivy, whose grandfather educated local women about ‘liberating their feet’ and who has her own political and social agenda, his eyes are opened further to the changing world about him and the role he can play in it. The Emperor of Shoes is interesting on many levels, not least because it takes a timely look at some of the many impacts of globalisation on emerging nation-states. Like Lisa Ko’s excellent The Leavers, it examines the exploitation of workers, although in this case in China itself by an American-owned company. Similarly, like Ko, Wise explores a conflicted parent–child relationship, here, that of father and son, Fedor Cohen representing the conservative old guard and Alex the liberating modern. For me though, the book is of particular note as a seemingly unusual addition to the No Exit list, established primarily on stellar indie crime fiction, and one of which I’m a great fan. And possibly this is a reflection of things to come, a wish to reach a wider, more mainstream audience. But that’s an aside. 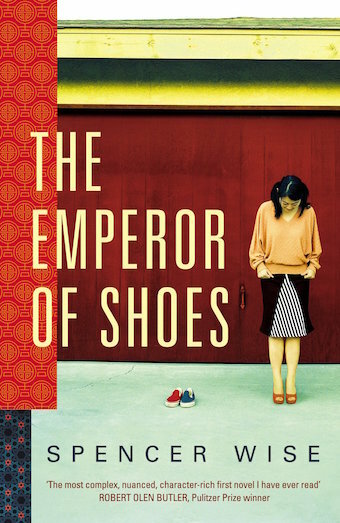 The Emperor of Shoes is an assured first novel and Wise weaves his story of naivety and greed in modern China with both flair and a healthy dose of humour. Our prediction is he’s a writer to watch. Acknowledgements: Quoted text from p. 7 The Emperor of Shoes © Spencer Wise 2018. This review is published as part of the virtual book tour organised by Anne Cater to whom we extend our thanks. Many thanks also to the publisher for supplying a book proof and the above jacket image. All opinions are our own. All rights reserved. Also of interest: Lisa Ko’s The Leavers, Dialogue’s brilliant debut; ‘20 books this summer challenge – lovely words‘, no 14 on the list; ‘Soundings – in search of one father’s war‘ (interview, artist Kate Gritton); ‘The stark beauty of William Shaw’s Salt Lane‘; ‘Johana Gustawsson’s Keeper –indie publisher, Orenda, does it again‘; ‘Elder’s last stand – John Harvey’s Body and Soul; ‘We should all be feminists’; ‘Jane Harper’s stylish debut – The Dry’.